If you’re a fan of college football, or if you simply love the Oregon Ducks, then you would understand that Oregon has possessed one of the most talented and successful football programs in the nation the last few years. Since 2009, the Ducks have won 70 games, which culminates to an impressive winning percentage of .864. Also, Oregon has appeared in 6 bowl games during that span, which includes the Rose Bowl, the 2011 BCS National Championship Game and the inaugural 2015 College Football Playoff national title game. Whether it’s been their flashy uniforms or their high-octane offense that leaves other teams in the dust, the Ducks have created an exciting, yet successful formula that has captivated fans in Eugene and across the country. Despite their achievements, the Ducks have never won a national title; however, that shouldn’t be a reason to disregard the success that Oregon has garnered in recent years. One of the special things about Oregon’s football program is that it likes to establish a tight-knit bond among the players and the coaches. The Ducks’ togetherness and the coaching staff’s ability to get the most out of their players has created a winning culture, which has been dubbed “Win The Day,” but they’ve also developed a plethora of players who have been great contributors on the field. It’s been nearly one month since the Ducks lost to Ohio State in the national championship game, and I’m sure that most Oregon fans are eager and excited to get the ball rolling again. To be quite honest, however, I’m a little worried about next season. Of course, there’s no question that the Ducks have a solid recruiting class coming in next year, which is headlined by Canton Kaumatule, a 5-star prospect and the No. 3 defensive end in the country, but I’m worried about the personnel that Oregon has lost due to graduation and the NFL Draft. 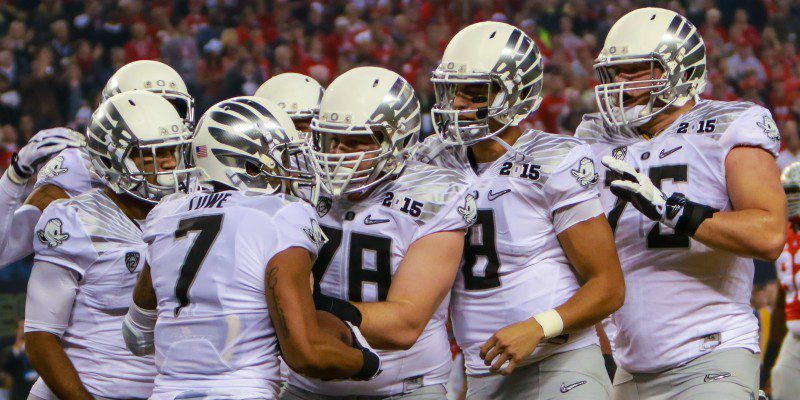 Arik Armstead’s presence was one of Oregon’s most important components. The Ducks’ display of sustained excellence the last few years has been well documented, but it’s no secret that their success has rested on the shoulders of multiple players who came up through the system together. 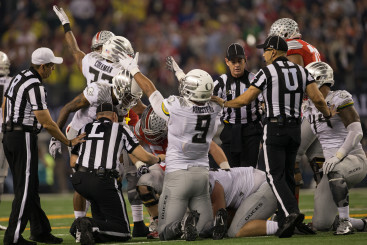 Oregon lost a great deal of talent, character and leadership following its loss to Ohio State. Even though the Ducks are rarely praised for their defense, Don Pellum, Oregon’s defensive coordinator, was credited for rejuvenating an Oregon defense that played with a lot more physicality late in the season. However, six defensive starters will no longer be suiting up for the Ducks next year, including Arik Armstead, Ifo Ekpre–Olomu, Erick Dargan, Tony Washington, Troy Hill and Derrick Malone. That’s a whole lot of talent and leadership that the Ducks will miss next season, and it won’t be easy to replace their experience. 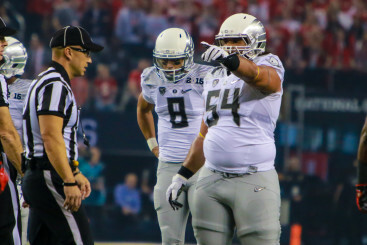 Hamani Steven’s role on the offensive side of the ball has been important for the Ducks. Furthermore, the Ducks have owned one of the most dynamic offenses in recent years, and one of the major components to their quick strike attack has been their offensive line. Players like Hamani Stevens, Jake Fisher, and Hroniss Grasu solidified the Ducks’ offensive attack, and their ability to protect the quarterback has been paramount to Oregon’s success, as well. Unfortunately, all three of them will no longer be with the Ducks next season, which means that Oregon will have to find a new combination to stabilize its offense. Lastly, and most importantly, the best player that the program has ever seen, the only Heisman winner in the school’s history, and an athlete that Oregon fans will never forget, is taking his talents to the NFL. The departure of Marcus Mariota, who is projected to be a top 10 pick in the draft, will be the biggest obstacle that the Ducks will have to overcome this offseason. There aren’t words that can describe what Mariota meant to Oregon’s football program, the community of Eugene, and to college football in general. Anytime you lose a once-in-a-lifetime talent, especially someone of Mariota’s caliber, it’s going to be tough to find a replacement. 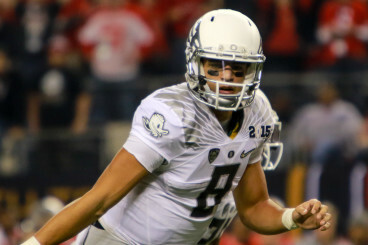 Marcus Mariota is the first Heisman winner in the school’s history. Like I mentioned before, the Ducks should feel confident about their incoming class, and it became official yesterday that Eastern Washington’s quarterback Vernon Adams, who has thrown 110 touchdown passes the last three seasons, will be transferring to Oregon, which undoubtedly makes him the favorite to replace Mariota. In the end I believe Oregon will be fine. The program always finds a way to be successful. However, it will be extremely difficult to replace the leadership and the experience of the multiple players that have moved on. I guess that’s just the way college football works. You just have to keep moving forward. What do you think? Are you worried about next season?